Respiratory diseases such as bronchitis, asthma, allergic rhinitis, pneumonia and sinusitis can significantly curtail the physical activities of the individual. The symptoms associated with both mild and severe manifestations of these respiratory conditions include coughing, wheezing, chest pain, respiratory distress, shortness of breath, congestion, and even death in severe cases. These conditions lead to substantial morbidity and causes large cost of burden to the society. Increasing air pollution can severely affect respiratory health of children as well as adults. Various studies conducted have shown the ill effects of air pollution that can exacerbate existing respiratory conditions such as asthma, COPD, and upper airway allergies. According to the Forum of International Respiratory Societies, in 2013, young children and infants were especially susceptible to respiratory diseases. Around 9.0 million children under the age of 5 years die per year and the common thing in them is the presence of lung diseases. Increase in evidences through such studies suggests that the exposure to certain type of air pollutants contributes to the onset of asthma. However, studies related to the exacerbation of pre-acquired and existing asthma are more prevalent as they provide favorable conditions to study. The global respiratory inhalers market was valued at US$ 27,424.4 million in 2016 and is expected to witness a robust CAGR of 5.7% over the forecast period (2017-2025). According to Next Breath, LLC, in 2013, in the U.S for asthma/COPD there were no generic inhalers available, which includes both categories of standard asthma treatment such as controller medications for long-term prevention and rescue medication for quick relief. The above inhalers medicine average cost ranges between US$ 35 and US$ 300, rendering the treatment expensive for both consumers that are insured as well as uninsured. Furthermore, there are various many pressurized metered dose inhalers (pMDIs) that are approaching towards the patent expiration, and due to the lack of a document from the U.S. Food and Drug Administration (FDA) for guidance, generic companies are reluctant to spend in new product development, which finally might not be acceptable to the agency. According to Forum of International Respiratory Societies, in 2013, it has been estimated that around 235 million people suffered from asthma and more than 200 million people were affected from chronic obstructive pulmonary disease (COPD), and around 65 million endure mild-to-severe COPD. Also, around 2 billion people were exposed to the toxic effects of biomass fuel consumption and air pollution and by tobacco smoke. Smart inhalers have embedded sensors with bluetooth technology. These devices also come up with touchscreens, audio visual medication reminders along with additional advantages such as mobile application connectivity, customized user interface options, real time analysis through cloud based portals through researchers and clinicians. In September, 2017, Adherium received approval from the U.S Food and Drug Administration (FDA) for its SmartTouch inhaler monitoring device to be used with AstraZeneca’s Symbiocort aerosol inhaler. In October, 2017, United Therapeutics Corporation received U.S. FDA approval for a new inhalation device TD-300/A, for the use with Tyvaso (treprostinil) inhalation solution to treat patient with pulmonary arterial hypertension. The device aid patient compliance and provides ease of use. It will also reduce the rate of therapy discontinuation associated with the current nebulizer. In September, GlaxoSmithKline plc, received approval for Trelegy Ellipta. Trelegy Ellipta, is the first once-daily use inhaler triple therapy (i.e. combination of 3 active molecules in a single inhaler) for the treatment of Chronic Obstructive Pulmonary Disease (COPD). In April, 2016, AstraZeneca received approval for Bevespi Aerosphere, the first product which uses AstraZeneca’s Co-Suspension Technology. The technology enables more than one medicine delivery from a single MDI. In 2010, around 115,000 patients were hospitalized due to sever chronic obstructive pulmonary disease, which cost the NHS around US$ 367.85 Mn and is expected to increase over the forecast period. Sandoz launched an innovative respiratory inhaler AirFluSal Forspiro in the UK in 2015, to capitalize on the highly lucrative market in the region. Increasing number of research collaborations is expected to improve the time-to-market of highly effective and advanced products. Some of the major players involved in global respiratory inhalers market are AstraZeneca, Beximco Pharmaceuticals Ltd., Boehringer Ingelheim GmbH, Cipla Ltd., GlaxoSmithKline plc, Koninklijke Philips N.V., Merck & Co., Inc., OMRON Healthcare Europe B.V., PARI Medical Holding and Teva Pharmaceutical Industries Ltd. Chronic respiratory diseases are the group of chronic diseases which affect airways, lungs and the other parts of respiratory system. Chronic respiratory disease include asthma and respiratory allergies, Chronic Obstructive Pulmonary Disease (COPD), Occupational Lung Diseases, Sleep Apnea Syndrome and Pulmonary Hypertension. However 70% chronic respiratory disease are asthma and chronic obstructive pulmonary disease. In 2012, globally, 1 billion people are affected with chronic respiratory disease and account for 7% of all global deaths with addition 1.4 million lung cancer deaths annually. Tuberculosis is considered as one of the communicable lung disease and in 2012, 1.3 million people died of tuberculosis and 8.6 million new cases were yet to be treated. The respiratory inhalers market is expected to gain steady traction in the foreseeable future as the product is available in various designs and can be used by any age group individual. Manufacturers are focused on reducing production costs and increasing profitability to sustain the market demand. Factors such as rising prevalence of asthma, chronic obstructive respiratory disease and other respiratory diseases propel the respiratory inhalers market globally. 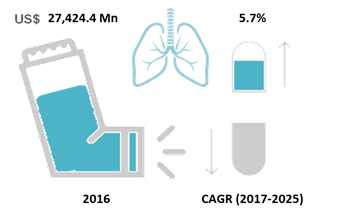 However, drawbacks such as lack of a single effective inhaler devices, adverse effects and difficulties faced during drug inhalation, lack of skilled pulmonologist, higher price of inhaler devices are factors hindering respiratory inhalers market growth. People suffering from respiratory disorders are now switching towards combinational therapies which is associated with benefits such as increased efficacy and easy reimbursement policies. Opting for combination therapies becomes tough for the individuals who have complex indications of respiratory disease. High preference of combination therapies such as triple combination therapy for chronic obstructive pulmonary disease (COPD) patients is expected to drive growth of the global respiratory inhaler market over the forecast period. Key companies covered as a part of this study include AstraZeneca, Beximco Pharmaceuticals Ltd., Boehringer Ingelheim GmbH, Cipla Ltd., GlaxoSmithKline plc, Koninklijke Philips N.V., Merck & Co., Inc., OMRON Healthcare Europe B.V., PARI Medical Holding and Teva Pharmaceutical Industries Ltd.